Swords have been around for a very long time. From ancient times up until the recent past, they were used as a weapon and thus stood for bravery, courage, defense and valor, to name a few. However, the symbolism of swords goes much deeper than weaponry and protection. In the alchemical realm, swords were used to symbolize purification. This makes sense, as the sharp blades of swords could swiftly and cleanly slice through anything, including the body and soul of a human. Furthermore, a double-edged sword use this spiritual avenue to symbolize the dualities that are present throughout nature. Most notably, though, is the duality between life and death. Even the creative process by which swords are made is symbolic. Because this process incorporates all elements of the world (earth, air, fire, and water), we can deduce that the birth of a sword is congruent with creation itself. This brings about themes of balance and unity, as well, since all of the elements join together for a common cause. In a general sense, though, swords can symbolize a variety of things, including aggression, strength, action, justice, leadership, and decision-making. Since swords have been used around the world for hundreds of centuries, the symbolism associated with them can also be culturally specific. As a Celtic symbol, the sword had very strong implications. Take a visit to a history museum in Dublin and you will find entire rooms filled with beautifully crafted swords. To the ancient Celts, the sword was first and foremost associated with the first king of Tuatha De Danann, Nuada. This clan were believed to under divine protection as they fought to take Ireland back from invaders. As such, Nuada’s sword is still deemed one of the four Celtic treasures. Many swords have been found under water in Ireland, proof of the personal sacrifice and tribute paid to Nuada, who was associated with the underwater realm. 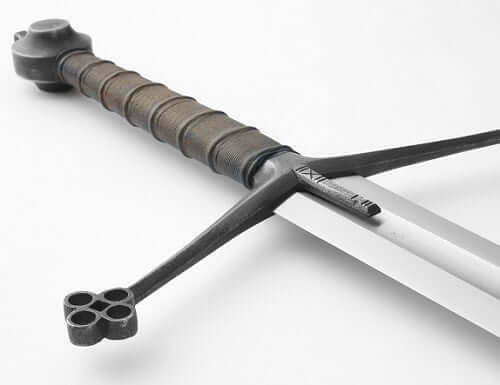 Later, in the Christian tradition, the sword also stood for justice, righteousness, and protection. The archangel Michael, messenger of God, is frequently depicted in old art with a sword, reinforcing the ideas of the power of heaven. Many works of art also depicted a fiery sword blocking the gates of the garden of Eden, where the original sin was committed. Here, it served as a warning of God’s omnipresence and power, as well as indication that only the pure of heart can enter the kingdom of God. Swords were also believed to remind Christians of the righteous and pure nature of their cause and faith. In the Congo of Central Africa, swords have a slightly different implication. There, these sharp objects act as symbols of transition. The crossguards of many swords feature one point turned upward toward the heavens while the other points earthwards. This symbolizes the journey and cycle between life and death. Additionally, in a more nature-driven sense, these opposite facing points connect the earth with the sky, making the difference between the living world and the afterlife seem less intimidating. Like other symbols, swords also have significance when they present themselves in dreams. The Chinese, like the Celts, also had an intricate network of spiritual and symbolic connections. In the case of the dreamt sword, the Chinese tradition made the association with the gender of an unborn baby. If the dream includes a woman pulling a sword from water, it is interpreted as an indication of a future son. In a more modern frame of mind, we can follow the teachings of Dr. Freud, who postulated that swords stimulate ideas focusing on personal character, truth, determination, and chivalry in the dream. These themes, according to him, are all quite phallic and masculine in nature. When you think about it, it does make sense – a sword certainly does mimic the male genitalia in its physical appearance. When analyzing the sword, there are many different points of entry that you can approach the topic from. No matter how you slice it, the sword does speak wonders to us. It may mean different things depending on if you are male or female, but this is what makes symbolic interpretation great. There are no rights and wrongs. Whatever something makes you think and feel is OK, because it is unique to you.